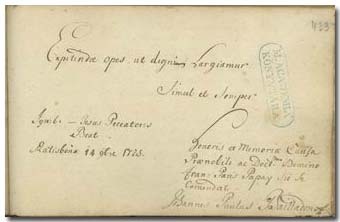 Pápai Páriz Ferenc, Album amicorum p. 433. Symb[olum]: – Jesus Peccatores Beat. * The quotation comes from Gabriele Simeoni, Imprese heroiche 35 (translated in several languages, usually bound together with the imprese of Giovio and Paradin). We should desire richness for rewarding those worthy of it * / now and forever. Motto: Jesus makes sinners happy. In Regensburg, on November 14, 1725.